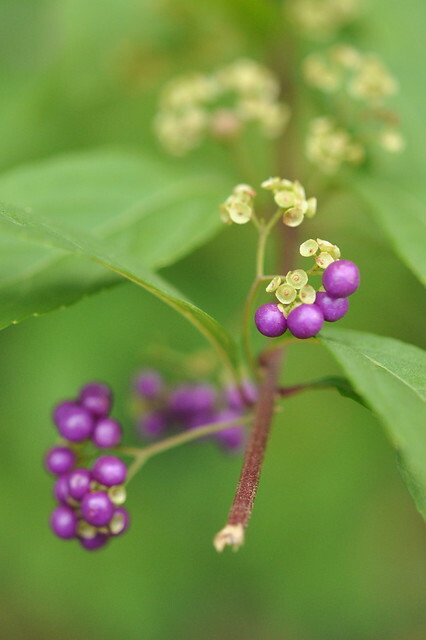 The first time I saw American beautyberry (Callicarpa americana) I couldn’t believe the color. Such a beautiul, iridescent purple. 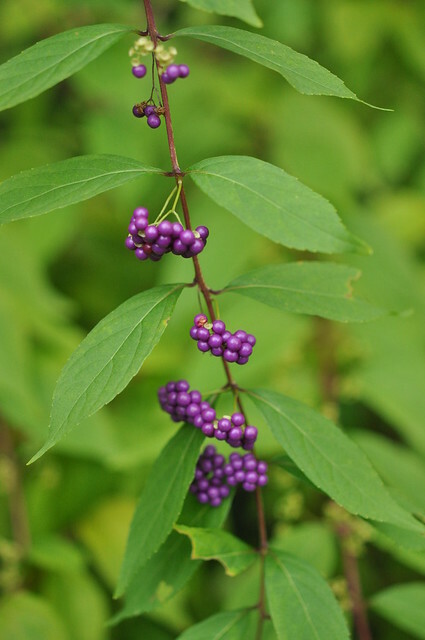 The berries appear in the fall, when lots of plants are going brown. Their color contrasts so well with the vibrant green of the leaves. I think the name is fitting. . . . 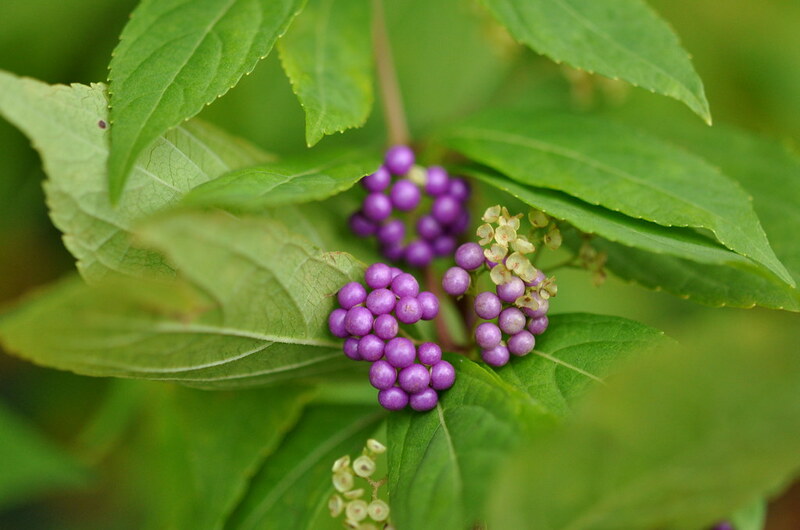 This entry was posted in photography and tagged American beautyberry, Callicarpa americana. Bookmark the permalink. 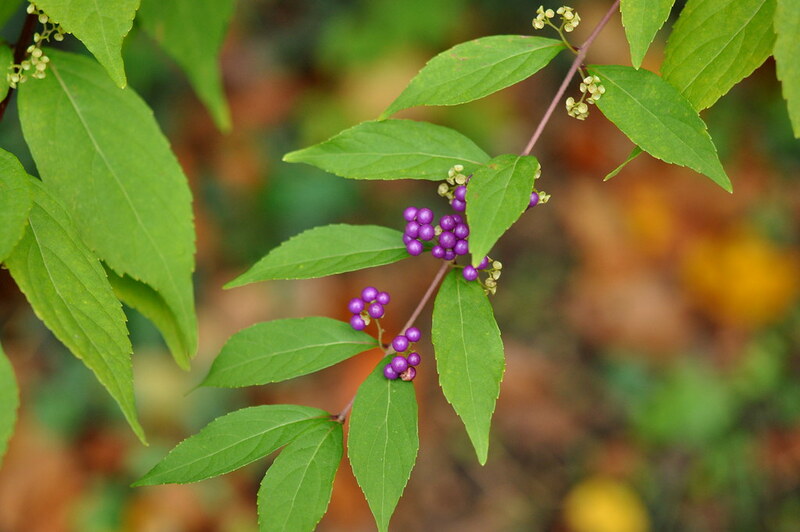 many folks here in E TX consider this a weed-bush – but personally, I LOVE the color ! I don’t think I’ve ever seen this plant before. I love the purple! I never saw it until I moved to the East Coast. Too cold in the Midwest! Oh, I should have tried growing them! Maybe next year. . . .
Intriguing plant. Stunning imagery. Thanks for the botanical lesson this morning, Carole! Thanks, Cheryl. Sometimes I wish I’d studied botany. I love plants. How amazignly beautiful. My favourite color combination. The name is so fitting. I love the colors too, Caroline. I saw this bush at the Ozark Folk Center recently for the first time and was facinated with it. Lovely. Lovely colors Carole. The purple against the green looks so rich. I wonder if they would grow in Minnesota. I’ll have to do some checking. Jeanne, I think it may be too cold out there. I never saw it growing up in the Midwest. Anything is possible, though. I have never seen these. Thanks for sharing. Purple is my favorite color. Just lovely! Those are gorgeous! I’ve never seen them before – thanks for sharing them. I have never seen that before! LOVE IT!! !